Like most influential guitarists, Carlos Santana's tone is a combination of three elements: his personal playing technique, his guitar (including pick choices), and his electronic equipment (including amp, effects, and speaker cabinets). As Carlos' career has evolved, so has his tone. He has gone through several stages, from the raw, unpolished sound of the debut album, Santana, to the much more polished and studio-controlled tones of his "collaboration" trio: Supernatural, Shaman, and All That I Am. There are several components involved in Carlos Santana's famous everlasting sustain: humbucker pickups, heavy guitar bodies, and overdriven amps. But the essential ingredient is physical placement of the guitar in relation to the speakers. Before a show, Carlos will turn his amplifiers up to performance volume, then walk around the stage until he finds the "sweet spot." This is the exact place where his notes will feed back just enough to create infinite sustain, without degenerating into the squeal often caused by runaway feedback. Once the spot is found, it is marked with tape. Thus, Carlos can move to that spot when he needs to make a note last for a long time. Although many guitarists attempt to recreate a master's sound by duplicating his (or her) equipment, the bald truth is that an enormous amount of a guitar player's sound is in his hands. You could take Eric Clapton, Eric Johnson, Jimmy Page, Neal Schon, and B.B. King (to name a few), and put them in front of the exact same equipment; each would sound quite different. Conversely, you could combine an accomplished six-string slinger like Jeff Beck with numerous different gear packages, and the result would always sound like Jeff. There are several outstanding features of Santana's playing technique that help to produce his unique signature. One of the most obvious is his use of long, sustained notes without vibrato. Carlos rarely employs vibrato. When he does, it is often the less-used vertical vibrato (moving the finger back and forth in parallel with the neck, as opposed to perpindicular to the neck). And his renowned sustained notes, held with a "straight tone" (sans vibrato), immediately identify him. His trills are often unique, as well. 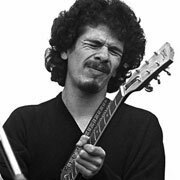 Santana has a way of hitting an initial grace note, quickly hammering on to a higher note, then pulling off to the original note. Although normally contained within a typical pentatonic scale, these trademark trills add a distinctively Latin flavor to his melodies.